If credit is not submitted for approval. If credit is not granted with the terms requested. If credit is accepted for an initial offer, but later rejected for a counter-offer. Even though the requirements seem straightforward, it isn’t always easy to identify which consumers warrant an Adverse Action letter, and how this fits into your sales process. ProCredit takes the guesswork out of compliance, and provides a solution that fulfills your legal obligations without sending unnecessary notices. The consumer was eligible, but chose not to buy for another reason. Some compliance solutions simply print an Adverse Action letter for all consumers who had their credit run but didn’t buy, including those consumers who had great credit. This is both unnecessary and potentially harmful to future sales. 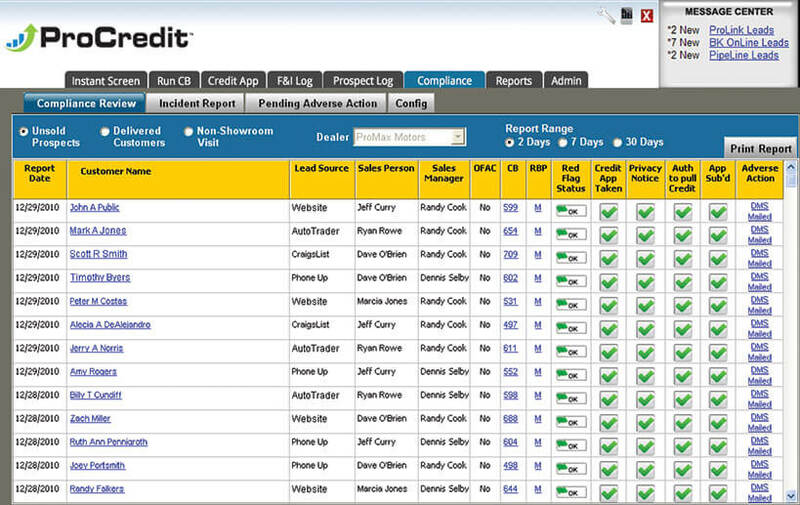 Why risk alienating unsold traffic that has good credit? Some dealerships rarely print any notices, relying on finance companies to do it. This approach will not protect you if your dealership is audited. The ProCredit solution empowers you to take the necessary course of action. In ProCredit, whenever a consumer’s information is entered in the system, they will appear on the Compliance Review Report. With this report you can view all compliance activity, and determine which actions need to be taken for which consumers. The Adverse Action column lets you know if a consumer was approved or declined, or if a notice has already been printed. Sign up for ProCredit’s Failsafe program and make sure nobody slips through the cracks. With the Failsafe program, we send Adverse Action letters to any consumers that were not approved for credit.